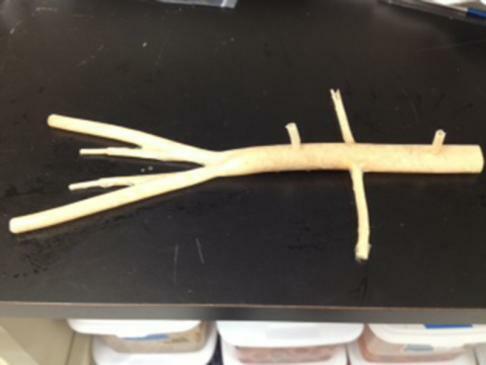 The Abdominal Aorta Model cuts, feels, sutures, and behaves like real live tissue. 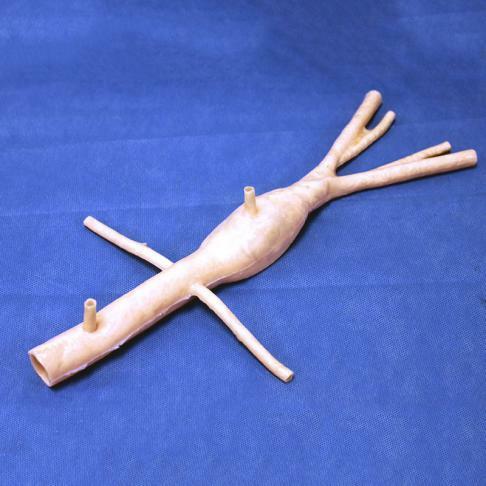 Realistic and affordable product designed for the acquisition, practice and retention of open aneurysm repair skills. Includes a 18 long AA, with realistic anatomy including Iliac arteries, Superior and Inferior Mesenteric Arterries and two renal arteries , with a 50 mm aneurysm located between the renal arteries and the iliacs bifurcation. The back of the aneurysm has 4 Lumbar Arteries as well. The AAA can be ordered with an aneurysm at different locations to replicate different pathologies required for a realistic simulation training experience. The AAA Model fits the AAA Abdomen Simulator, as well as other commercially available AAA Abdomen simulators. Open Aneurysm Repair Training access aneurysm, train in all the procedures to repair the aneurysm, suture the graph and check for the quality of the procedure with the pulsatile pump. Price: $225.00 – $4,488.75 (sold Individually, 10 Pack, 20 Pack).